Laparoscopic skills training outside the operating room is becoming the standard for educating surgical residents. There are various methods of training outside the operation theatre ranging from inanimate models, virtual simulation and training on cadavers. The best method of training has not yet been well established. This study prospectively evaluates the laparoscopic skills acquisition in a short term, intensive, focused training in a phantom model using porcine gall bladder. 62 surgeons with no prior experience of performing laparoscopic cholecystectomy undergoing training in the Minimally Invasive Surgery Training Centre at our Institute were enrolled for the study. Participants during the training course perform 10 laparoscopic cholecystectomies in a porcine gall bladder integrated in a specially designed MIC Tuebingen trainer. The trainer is designed in the human anatomical form of an insufflated abdomen and the equipment and hand instruments are same as that used in the human beings. The laparoscopic skills acquisition was evaluated in terms of operation time, cystic duct dissection, and cystic artery dissection, plane of dissection (liver injury) and gall bladder perforation. These parameters were objectively assessed on a scale of 1-5. 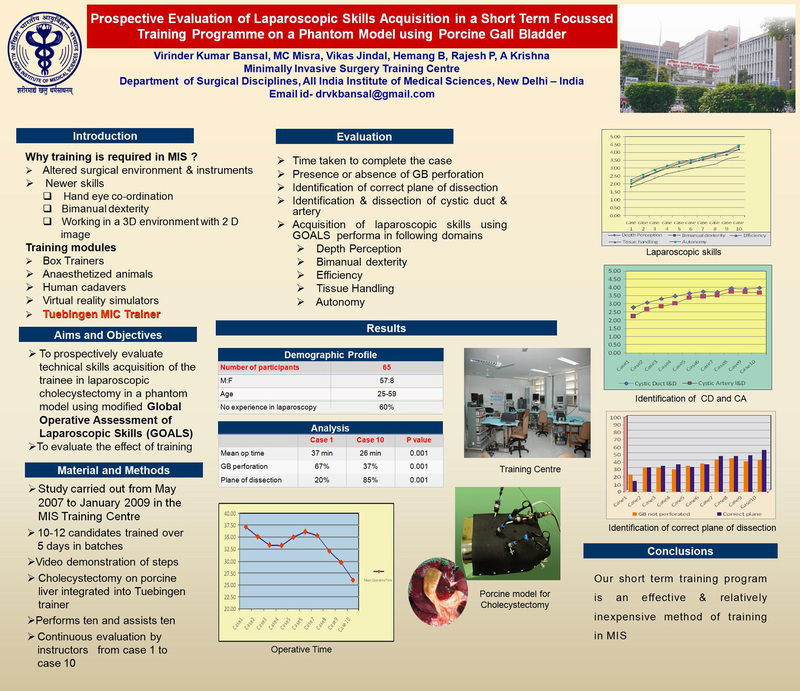 Technical laparoscopic skills acquisition was assessed by modified Global Operative Assessment of Laparoscopic Skills (GOALS) system based on depth perception, bimanual dexterity, tissue handling, efficiency and autonomy. Data are expressed as mean +/- SD; statistical analysis was performed by repeated measure ANOVA. p value less than 0.05 was considered significant.